The Hawaii Bamboo Orchid plant is probably the easiest orchid you will ever grow. This plant grows and multiplies quickly, providing you with plenty of beautiful flowers and strong, dark green foliage. Given enough room and care, this orchid plant can grow up to 8' tall, but in a controlled environment, can be a delightful houseplant. The flowers are rarely used in arrangements as they do not have a long cut life, but the foliage is often used in cut flower arrangements, as the foliage is strong, long lasting and provides a beautiful spray of leaves as a background or filler. This plant does not tolerate "wet feet" (soil with poor drainage) or frost. We only provide rootless plants at this time. With little care, this plant develops roots. 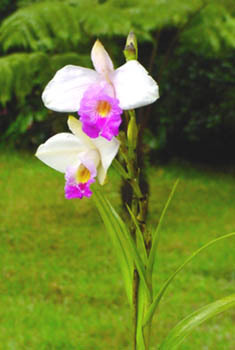 A printable version of care instructions for the Hawaii Bamboo Orchid plants is provided here.